Facebook Social Toolkit is a browser extension with collection of various tools which will help you grow your Facebook Social profile.It is made for Google Chrome Browser.Today I am sharing with you Premium version of Facebook Social Toolkit for free.This is the best toolkit for Facebook because its automation tools save your time like Facebook Auto Group Poster, Auto Comment Mentioning Tool, Turn Off Facebook Last Seen etc.Facebook Social Toolkit can also be used for marketing purpose as it helps you to socialize more in a community also it helps you to grow your brand.Its popularity is gaining day by day.Those were old days when we used scripts in Console box to perform certain tasks.Many people are using Free Facebook Social Toolkit Plugin as they cannot afford to buy a premium licence to use premium tools for facebook account.To comfort you I am going to provide the premium version of Facebook Social Toolkit which I have purchased.I am sharing it with you.Below you can download the premium version of Facebook Social Toolkit. 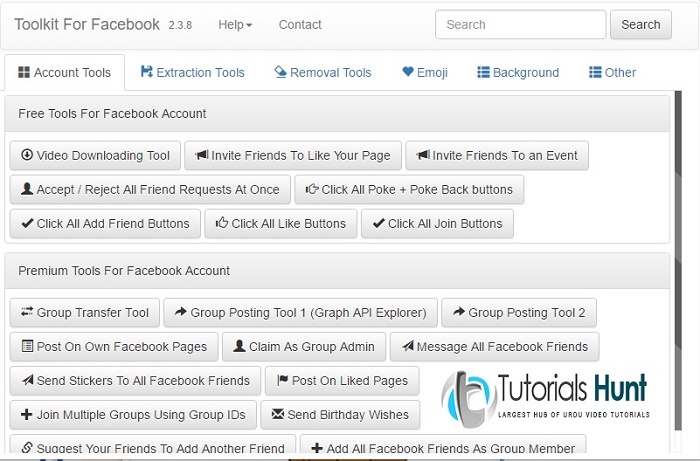 Facebook Social Toolkit has bunch of automation tools which are divided into four sub headings. Now let me explain you these tools.Account tools consist of basic tools which result very helpful for every Facebook user like downloading Facebook videos, adding all friends in a single click.Favorite tool of mine is Claim As A Group Admin.Using this tool you can be admin of a group who has no admin.Extraction tools are very helpful for business and personal use these help you make a list of emails and phone numbers of your Facebook friends. Removal tools are for cleaning up your profile like removing friends or getting out of groups,unliking facebook pages and rejecting all friend requests at once.Emojis are used in chats and commenting.These are very new and are of every types you can simply copy paste these to use.Hiding/Disabling Facebook last seen is awesome as it gets you out of weird situations.When you are not in a mood in replying someone you can use it as Seen on other person’s account will not be shown.He/She will not be able to see if you read their message.You can simply read all messages on Facebook without letting the other person know. I hope you like the giveaway of Facebook Social Toolkit.Please share it with your friends.